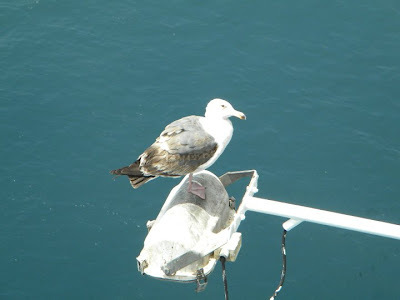 My sister took this photo of a Seagull when they went on a cruise to Mexico. Honestly, I haven't seen a seagull yet in my entire life. I only see this bird on TV. Happy Weekend everyone and enjoy the summer heat. I can't imagine not having seen a seagull! Wow! They are like crows around here...you must very VERY inland from the sea...nice photo of the gull...they love to sit on anything not meant for them to sit on. Great shot! I can not believe you have not seen a seagull. They seem to be everywhere. Great shot! Where do you live if you have never seen a gull before? Your sister's photo is great, thank you for sharing it. Your first sighting of a seagull will be a lot of fun. They can be very entertaining to sit and watch. Noisy and greedy but one of my favorite birds as I love anything to do with the ocean. If you have time to stop by, my Camera Critter post is right here. Nice seagull photo! A cruise would be fun during the summer heat. way seagull diri oi... hahah... wow... korek si Dhemz sa baroto ka ko ka cruise... mag-bout ka kung sa suba... hahahah!